Even the most advanced box mod can't perform at its best without a high quality tank loaded on top. To ensure the best possible experience, equip your vape with the SMOK TFV12 Prince Tank. 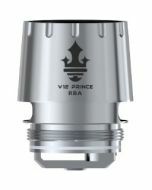 The SMOK TFV12 Prince Tank features SMOK's innovative new Cobra drip tip. Available in a range of bold colors, this tip features an edgy snakeskin pattern that adds flair to the tank. 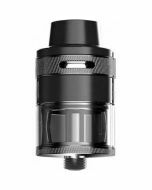 Not just made with looks in mind, the drip tip also greatly boosts airflow to treat you to full, satisfying draws. 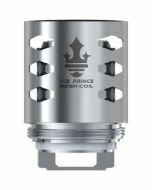 To make the SMOK TFV12 Prince Tank the finest vape money can buy, the experts at SMOK have designed it with only the absolute best materials. The housing is fashioned out of stainless steel, giving it a sleek finish and the durability required to hold up to daily use. Corrosion resistant and nontoxic, the steel housing separates the tank from the competition. 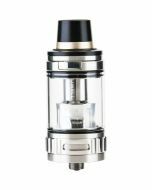 Your e-juice is contained within a food-grade Pyrex glass tank to preserve its quality. The glass is resistant to breakage and damage due to heat to help ensure longevity. Able to hold up to 8 milliliters of e-juice, the SMOK TFV12 Prince Tank features an incredibly high capacity. As a result, you can use your vape pen or box mod for longer without having to worry about refilling. 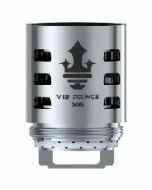 Adding more e-liquid to the SMOK TFV12 Prince Tank is a simple task. An e-juice slot lets you dispense juice directly into the top of the unit. Once the tank is full, the locking mechanism closes the chamber to prevent messy leaks. 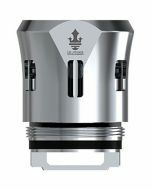 The SMOK TFV12 Prince Tank features hyper drive technology to give you massive vapor clouds that are richly flavored. Each of the available cores features 12 holes along the body, allowing the e-juice to fully saturate the cotton to ensure smooth, consistent performance. These holes also vent excess air, helping to prevent that unpleasant burned taste that can occur with some vape tanks. 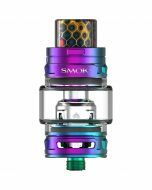 Offered in a wide range of colors, the SMOK TFV12 Prince Tank makes a bold statement. You can select from a wide range of cores to customize your experience. 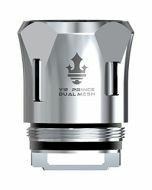 The tank comes with a V12 Prince-Q4 coil for deep, rich vapor, a Prince-X6 core for a silkier taste and sizable clouds and the Prince T10 with decuple coils. 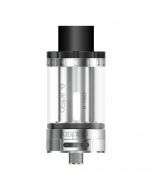 An RBA and quadruple coil tank core are also available separately. Enjoy vaping to the fullest with the advanced performance and practical features of the SMOK TFV12 Prince Tank. Order this top-of-the-line vape tank today.